As y'all know I've been musing about iPads... It is clear they are a huge success. There is no "killer app", and yet millions of these devices have flown off the shelves, and an entire economy is forming around them. What is happening here? 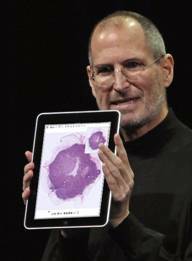 Last week I made my annual pilgrimage to the RSNA show - the largest medical imaging show in the world - please find a report on my Aperio blog - and iPads were absolutely everywhere. In booths and as booth giveaways, and in attendees hands. So ... of course the salient feature of the iPad is "it's a tablet", but I'm beginning to think the form factor is a red herring. I now think the important thing about an iPad is that it is simple. In particular, simpler than a computer. The form factor plays into this - no keyboard, no mouse, no ports - but if there were a computer with a keyboard and mouse and ports which ran iOS, it would be a major success, too. (In fact, as John Gruber considers, this may be the future direction of Macs.) Philip Greenspun makes a similar point: iPad makes life easier. 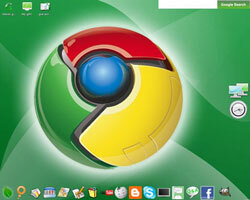 Certainly it makes computing life easier; if you spend time on the web, emailing, facebooking, tweeting, etc. then using an iPad for these things is easier than using a computer. Especially "for the rest of us", which most emphatically does not include me, but includes surprise iPad lovers like my Mom. Which is why this may not have been obvious to me. I wonder if a dirt simple OS for Intel computers could be equally successful?